The traditional role of a centre-forward is to score the majority of goals on behalf of the team. The player may also be used to win long balls or receive passes and retain possession of the ball with their back to goal as teammates advance, in order to provide depth for their team or help teammates score by providing a pass ('through ball' into the box); the latter variation usually requiring quicker pace and good movement. Most modern centre-forwards operate in front of the second strikers or central attacking midfielders, and do the majority of the ball handling outside the box. The present role of centre-forward is sometimes interchangeable with that of an attacking midfielder, especially in the 4–3–1–2 or 4–1–2–1–2 formations. The term "target man" is often used to describe a particular type of striker whose main role is to win high balls in the air and create chances for other members of the team (not necessarily scoring many goals themselves). These players are usually tall and physically strong, being adept at heading the ball. 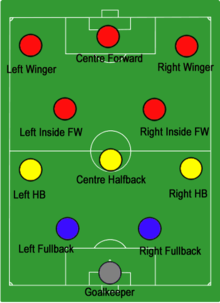 The term centre-forward is taken from the early football playing formation in which there were five forward players: two outside forwards, two inside forwards, and one centre-forward. When numbers were introduced in the 1933 English FA Cup final, one of the two centre-forwards that day wore the number nine – Everton's Dixie Dean a strong, powerful forward who had set the record for the most goals scored in a season in English football during the 1927–28 season. The number would then become synonymous with the centre-forward position (only worn that day because one team was numbered 1–11 whilst the other was numbered 12–22). The role of a striker is rather different from that of a traditional centre-forward, although the terms centre-forward and striker are used interchangeably at times, as both play further up the field than other players, while tall, heavy and technical players, like Zlatan Ibrahimović, have qualities which are suited to both positions. Like the centre-forward, the traditional role of a striker is to score goals; strikers are therefore known for their ability to peel off defenders and to run into space via the blind side of the defender and to receive the ball in a good goalscoring position, as typified by Ronaldo. They are typically fast players with good ball control and dribbling abilities. More agile strikers like Michael Owen have an advantage over taller defenders due to their short bursts of speed. A good striker should be able to shoot confidently with either foot, possess great power and accuracy, and have the ability to link-up with teammates and pass the ball under pressure in breakaway situations. While many strikers wear the number 9 shirt, the position, to a lesser degree, is also associated with the number 10, which is frequently worn by more creative deep-lying forwards such as Pelé, and occasionally with numbers 7 and 11, which are often associated with wingers. 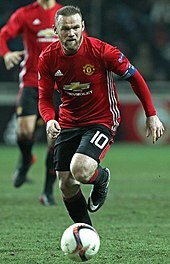 Wayne Rooney was used by Alex Ferguson as a second striker on many occasions. Deep-lying forwards have a long history in the game, but the terminology to describe their playing activity has varied over the years. Originally such players were termed inside forwards, creative or deep-lying centre-forwards. More recently, two more variations of this old type of player have developed: the second, or shadow, or support, or auxiliary striker and, in what is in fact a distinct position unto its own, the number 10, exemplified by Dennis Bergkamp (who would play just in behind the striker Thierry Henry at Arsenal). Other number 10s who play further back, such as Diego Maradona, Ronaldinho and Zinedine Zidane, are often described as an attacking midfielder or the playmaker. The second striker position is a loosely defined and most often misapplied description of a player positioned somewhere between the out-and-out striker, whether he is a "target-man" or more of a "poacher", and the Number 10 or attacking midfielder, while possibly showing some of the characteristics of both. In fact, a term coined by French advanced playmaker Michel Platini, the "nine-and-a-half", which he used to describe Roberto Baggio's playing role, has been an attempt to become a standard in defining the position. Conceivably, a Number 10 can alternate as a second-striker provided that he is also a prolific goalscorer; otherwise, a mobile forward with good technical ability (dribbling skills and ball control) and link-up play, who can both score and create opportunities for a less versatile centre-forward, is more suited. Second or support strikers do not tend to get as involved in the orchestration of attacks as the Number 10, nor do they bring as many other players into play, since they do not share the burden of responsibility, functioning predominantly as assist providers. In Italy, this role is known as a "rifinitore" or "seconda punta", whereas in Brazil, it is known as "segundo atacante" or "ponta-de-lança". 2–3–5 formation: the inside forwards (red) flank the centre-forward. The position of inside forward was popularly used in the late nineteenth and first half of the twentieth centuries. The inside forwards would support the centre-forward, running and making space in the opposition defence, and, as the passing game developed, supporting him or her with passes. The role is broadly analogous to the "hole" or second striker position in the modern game, although here there were two such players, known as inside right and inside left. WM Formation: the inside forwards (red) occupy a more withdrawn position supporting the centre-forward and outside right and left. In early 2–3–5 formations the inside-forwards would flank the centre-forward on both sides. With the advent of the "WM" formation, the inside forwards were brought back to become attacking midfielders, supplying balls to the centre-forward and the two attacking outside forwards – known as the outside right and outside left. In the modern game, inside forwards have either been pushed up front to become out-and-out attackers (in 4–3–3 formations) or one has been switched back into midfield and the other up front (in 4–4–2). Many teams, however, still employ one of their strikers in a withdrawn role as a support forward for the main striker, in a role broadly similar to the inside forward. An outside forward plays as the advanced forward on the right or left wing – as an outside right or outside left, typically as part of a 2–3–5 formation or one of its variants. As football tactics have largely developed, and wingers have dropped back to become midfielders, the terminology has changed and "outside forward" has become a historical term. Many commentators and football analysts still refer to the wing positions as "outside right" and "outside left". Scoring: their first option should be to shoot, while their second option should be to find another way to create a goal opportunity for the team. Passing: when they run into a shooting angle that is unlikely to become a goal, they must find a way to pass the ball to the middle of the penalty box area allowing the centre-forwards to finish the job. A winger is an attacking player who is stationed in a wide position near the touchlines. They can be classified as forwards, considering their origin as the old "outside-forward" position, and continue to be termed as such in most parts of the world, especially in Latin and Dutch footballing cultures. However, in the British game (in which the 4–4–2 formation and its variants are most commonly used) they are usually counted as part of the midfield. It is a winger's duty to beat opposing full-backs, deliver cut-backs or crosses from wide positions and, to a lesser extent, to beat defenders and score from close range. They are usually some of the quickest players in the team and usually have good dribbling skills as well. In their Dutch, Spanish and Portuguese usage, the defensive duties of the winger have been usually confined to pressing the opposition fullbacks when they have the ball. Otherwise, a winger will drop closer to the midfield to make himself available, should his team win back the ball. In British and other northern European styles of football, the wide-midfielder is expected to track back all the way to his own corner flag should his full-back require help, and also to track back his marker, as well as tucking into the midfield when the more central players are trying to pressure the opposition for the ball, a large responsibility for attack-orientated players, and particularly those like Joaquín (winger/wide midfielder), Cristiano Ronaldo (winger/striker) or Ryan Giggs and John Barnes (winger/central midfielder) who lack the physical attributes of a wing-back or of a more orthodox midfield player. As these players grow older and lose their natural pace, they are frequently redeployed as Number 10s between the midfield and the forward line, where their innate ball control and improved reading of the game in the final third can serve to improve their teams' attacking options in tight spaces. An example is Inter Milan's use of veteran Luís Figo behind one or two other attackers, as a second striker or attacking midfielder. In recent years there has been a trend of playing inverted wingers – wide men stationed on the 'wrong' side of the pitch, in order to enable them to cut inside and shoot on their stronger foot and sometimes provide in-swinging crosses. This tactic was used by Frank Rijkaard, who whilst at Barcelona, moved Lionel Messi from the left flank onto the right wing, initially against the player's wishes, allowing him to cut into the centre and shoot or cross with his left foot. Barcelona's Lionel Messi has been a proponent of the false 9 position to much success in recent years. The false 9, in some ways similar to a more advanced attacking midfielder/playmaker role, is an unconventional lone striker or centre-forward, who drops deep into midfield. The purpose of this is that it creates a problem for opposing centre-backs who can either follow the false 9, leaving space behind them for onrushing midfielders, forwards or wingers to exploit, or leaving the false 9 to have time and space to dribble or pick out a pass. The term comes from the traditional number for centre-forwards (nine), and the fact that normally a centre-forward traditionally stayed near the line of defenders until they got an opportunity to move past them toward goal. Key attributes for a false 9 are similar to those of a deep-lying striker: dribbling ability to take advantage of space between the lines, good short passing ability to link up with the midfield and vision to play through teammates making runs from deep to goal. The first false 9 in a World Cup was Juan Peregrino Anselmo in the Uruguay national team, although he could not play the match against Argentina in the 1930 World Cup due to injury. Matthias Sindelar was the false 9 of the Wunderteam, the Austria national team, in 1934. A false 9 was also utilized by Hungary during the beginning of the 1950s, with striker Nándor Hidegkuti acting in the role. Roma under manager Luciano Spalletti used Francesco Totti, nominally an attacking midfielder or trequartista, up-front in an innovative "4–6–0" formation; this was met with a run of 11 consecutive victories. At Euro 2012, Spain manager Vicente del Bosque, although sometimes using a typical striker in Fernando Torres, used a false 9 in Cesc Fàbregas in several matches, including the final. By the end of 2012, the False 9 had gone "mainstream" with many clubs employing a version of the system. Barcelona's Lionel Messi has been an exponent of the false 9 position to much success in recent years, first under coach Pep Guardiola and later under his successor Tito Vilanova. One approach to stop false 9s has been to create congestion in the midfield by bringing several players back into a more defensive role in an attempt to deny them space needed to create plays, notably in José Mourinho's "parking the bus" strategy. Alex Morgan (13) and Abby Wambach (14); Morgan and Wambach combined for 55 goals in 2012 – matching a 21-year-old record set in 1991 by Michelle Akers (39 goals) and Carin Jennings (16 goals) as the most goals scored by any duo in U.S. WNT history. A strike team is two or more strikers who work together. The history of football has been filled with many effective combinations. Three-man teams often operate in "triangles", giving a wealth of attacking options. Four-man packages expand options even more. Strikers must also be flexible, and be able to switch roles at a moment's notice, between the first (advanced penetrator position), second (deep-lying manoeuvre) and third (support and expansion, e.g. wings) attacker roles. Another example was the Total Football played by the Dutch team in the 1970s, where the ability of their players, and in particular Johan Cruyff, to swap positions allowed a flexible attacking approach which opposition teams found difficult to effectively mark. ^ Cox, Michael (3 September 2010). "FIFA's 289-page Technical Report on the 2010 World Cup – in 15 points". Retrieved 17 August 2013. ^ Cox, Michael (19 March 2010). "Is Barcelona's alternative shape really a 4–2–4?". Retrieved 17 August 2013. ^ Cox, Michael (5 March 2010). "Teams of the Decade #5: Roma, 2007". Retrieved 17 August 2013. ^ Smyth, Rob (17 September 2016). "Ronaldo at 40: Il Fenomeno's legacy as greatest ever No 9, despite dodgy knees". The Guardian. Retrieved 9 September 2018. 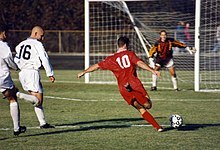 ^ "Target Man Definition In Soccer - Meanings & Examples From SportsLingo.com". ^ a b Khalil Garriot (21 June 2014). "Mystery solved: Why do the best soccer players wear No. 10?". Yahoo. Retrieved 19 May 2015. ^ "Zlatan Ibrahimovic to Manchester United: What will he bring? | Football News". Sky Sports. Retrieved 7 August 2016. ^ "News". FC Barcelona. Retrieved 7 August 2016. ^ "The Essence of the Number 10: A Beginner's Guide". Afootballreport.com. Retrieved 12 January 2015. ^ "AdTech Ad Roberto Baggio:| 'Allenare l'Italia? Non si sa mai'". Calciomercato.pro. Retrieved 12 January 2015. ^ "Positions guide: Behind the striker". BBC Sport. 1 September 2005. Retrieved 21 June 2008. ^ "Platini: Baggio, Il Fu Nove E Mezzo" (in Italian). Archived from the original on 4 June 2013. Retrieved 16 June 2012. ^ Guimarães, Levy (2 June 2013). "Segundo atacante: uma posição em desuso". Doentes por Futebol. Retrieved 13 August 2016. ^ "Positions guide: Wide Midfield". BBC Sport. 1 September 2005. Retrieved 21 June 2008. ^ Reng, Ronald (27 May 2011). "Lionel Messi". Financial Times. Retrieved 12 January 2015. ^ a b "Football Tactics for Beginners: The False 9". The False 9 – Football Tactics Simplified. Retrieved 17 January 2017. ^ "Building the Ideal False Nine for the Modern Era". Bleacher Report. 16 May 2013. Retrieved 14 May 2014. ^ "Great Team Tactics: Francesco Totti, Roma and the First False Nine". Bleacher Report. 6 December 2012. Retrieved 14 May 2014. ^ "5 The football tactical trends of 2012". The Guardian. Retrieved 8 January 2019.